ONE OF A KIND GATED ESTATE!! PRIVATE TENNIS COURT! Welcome to Mountain Therapy. A one of a kind gated estate with an 'in town' location. This house boasts over 5,000 Sq Ft and sleeps 9 people. If you count the comfy couches it can sleep a few more. It has a synthetic grass tennis court as well as a heated swimming pool (Seasonal).Walking distance to the town of Banner Elk with all its restaurants and fine shoppes. This truly is a one of a kind property and will not disappoint. Beautiful views of Grandfather Mountain and beyond. One of a kind!! At a minimum, the home is stocked for your convenience with cooking spices, coffee filters and more! The property’s location, views and amenities exceeded our expectations!! This was the perfect property for our entire family to enjoy!! We had a wonderful long weekend!! We will be renting again! The home is beautiful. The owner is extremely responsive. We thoroughly enjoyed our stay and would absolutely book again. Wonderful time in Banner Elk! Thank you for sharing your beautiful home with us. We had a wonderful time! The house was perfect. It had everything we needed and then some. We loved all the games, heated pool and amazing yard. There was plenty to do to keep the kids busy on a rainy day. We were so happy that you were able to accommodate us on such short notice. Ed, Kenny and Priscilla were a pleasure to work with. They were able to get the house ready for us with only an afternoon's notice. Banner Elk is the perfect getaway with lots of cute shops and restaurants. The local grocery store was well equipped and the locals were helpful and very friendly. We will definitely come back! We had an amazing time. The house was immaculate. We loved the fireplace. We had a group of 9 and had plenty of room. The kids loved the bunk beds, ping pong, and fusball. the kitchen was well stocked. The only issues we had was that it snowed and had to buy chains to be able to get up the steep windy driveway. One of the cars couldn’t make it up after the snow. We had to shuttle the other family up with the car with chains. Also, it was so frigid that the master bedroom shower wouldn’t work because we think the pipes froze. We called maintenance and the shower issue was resolved quickly. The issues we had were due to the weather and frigid temperatures and weren’t the owners fault. We had a 5 Star trip! This was a wonderful and beautiful location for our family gathering. Everything was perfect! My mouth dropped the moment I walked through the door. The house is gorgeous. The views are gorgeous. The location is perfect. We walked to town (Banner Elk) with our dogs to have lunch. Great walk. Nice challenge on the way back to the house hiking up the road! We love to hike. House was spotless with an abundance of towels, and everything else you are accustomed to at home. We loved it so much, we are thinking of buying a neighboring lot so we can build a mountain home. Wish we could have stayed longer. 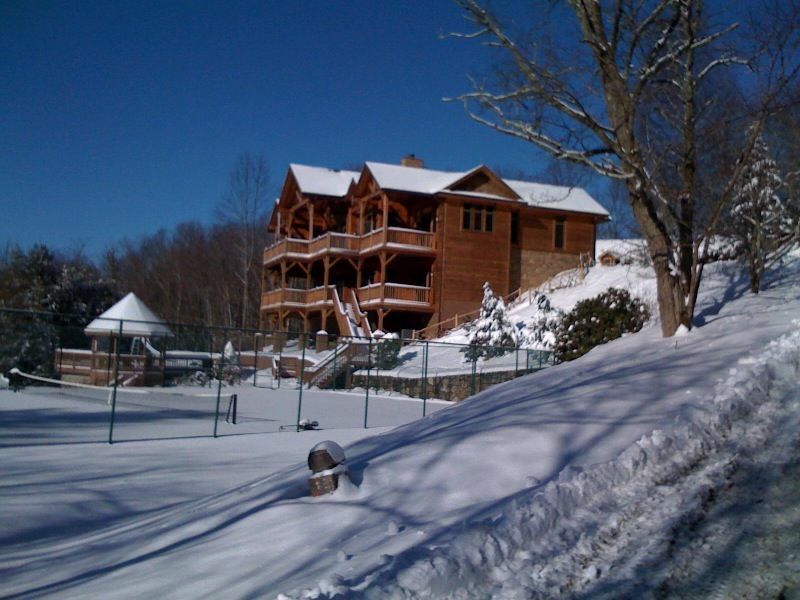 The house comes with a membership to the prestigious Beech Mountain Country Club. Includes golf, tennis, and award winning dining.